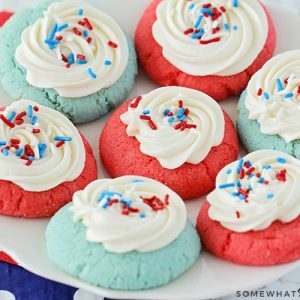 These patriotic jello cookies are the perfect addition to any upcoming Fourth of July celebrations, whether you're having a BBQ or picnic, or staying home and watching fireworks from your lawn. They are simple to make and taste delicious! Cream together your butter and sugar until mixed. Add in your eggs and vanilla and mix well. Add in your flour, salt, and baking soda. Combine everything together. Divide your dough in half and add 3 TBS of red jello to one and 3 TBS to the other. Add in about 1/4 tsp red food coloring to the red mix and the same amount of blue food coloring to the blue dough. Add 1 TBS red jello mixed with 1 TBS sugar to a small bowl. And do the same with the blue jello. Roll your cookie dough into small tablespoon sized balls and roll each ball into the coordinating jello sugar. Put your cookie dough balls onto a prepared baking sheet and squish them down with the bottom of a cup. Cook for about 8-10 minutes. Allow to cool completely then decorate with frosting and sprinkles and ENJOY!